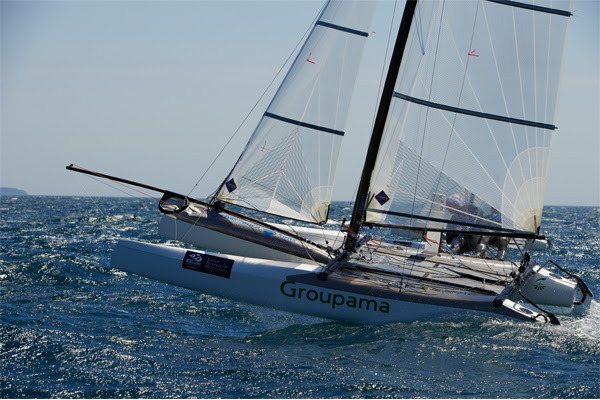 After a first year of Olympic preparation, which culminated in victory at the French Olympic Week in October 2013, Franck Cammas and Sophie de Turckheim will be attacking the first event of the 2014 season aboard the Nacra 17 Groupama in Palma de Mallorca. With the Omani leg of the Extreme 40 only just complete, the French duo set a course for the Balearics to join up with the members of the French Olympic Sailing Team and its coach, Franck Citeau. After the long weeks of winter training in Agadir, it's now time for the World Cup, which will have a stopover in Palma from 31 March to 5 April. This event will serve as the qualifier for the World Championships in Santander in September and the Rio Test Event this coming August. The stakes are high since only the top two French crews will qualify for Rio and the top three for Santander. When you're familiar with the level of the French team, which has monopolised the podiums since the arrival of this new Olympic series, you can well imagine how intense the racing will be. "It kicks off on Monday and Sophie and I are ready. Palma's race zone is well suited to Olympic sailing and is renowned for being very open. We've been training here for some days and it's not going too badly," Cammas said. "Since last year, everyone has made progress with the handling of the Nacra 17. You're always finely balanced and never far from a capsize. It's very technical," he added. "We're just back from a training session with the French Team. We worked on speed and finished with a short race, which we won. We're quick downwind. Franck and I never start a race without wanting to win it. We complement each other and we're pretty versatile, even though we've still got some progress to make in breezy conditions in excess of 20 knots," de Turckheim said. Up against World Champions Besson-Riou, as well as Vaireaux-Audinet and Ogereau-Vandame, the Groupama crew will have to up their game. This Franco-French battle mustn't overlook the overseas competitors too of course, among whom we find one of the favourites, Spaniard Iker Martinez, as well as the Australians, the British, the Swiss, the Italians and also the Austrians. "On Monday light airs are forecast, but it could really pick up over the following days. The problem is that we're setting sail from the beach. As such, if the seas are too big, we won't be able to get out on the water due to the rollers," concluded Sophie de Turckheim.